The Kodak Point-of-Care CR System is a robust, lightweight tabletop system that provides throughput from 20 to 60 plates per hour (14 x 17 cassette), with optional high-resolution scanning modes. With the flexibility to choose from five different image looks, you are able to customize your image preferences for different exams. Mounted on a wheeled Z-cart (optional), it can be conveniently rolled into any situation where instant digital images are needed, and because it is lightweight, the Kodak Point-of-Care CR System is a perfect fit for mobile applications and portable x-ray field. 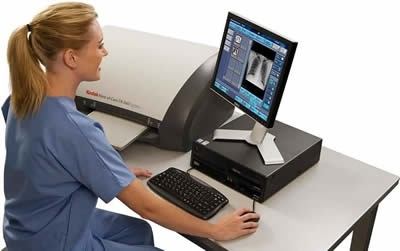 The Kodak Point-of-Care CR 140 System is ideal for computed radiography examinations in busy clinics and specialty practices such as chiropractors, podiatrists, and orthopaedists. It is also recommended for satellite locations, and remote sites such as military field installations. Durable, compact, and lightweight, this system enables all imaging functions to be performed at the point of patient care with one affordable package that includes the single-plate CR reader, Kodak flexible phosphor screens, advanced image management software, and a PC-based review station. Kodak Image Processing is used on the Kodak Point-of-Care CR System and is designed to provide high-quality images that meet your diagnostic needs. With its DICOM 3.0 capabilities, the system can be seamlessly integrated with a broad variety of printers, modality equipment, RIS and PACS systems.